Hosting a Street Feast is easy right? Right! To show you just how easy it is to host a Street Feast, we thought we’d chat with a few Street Feast hosts to let us in on what they are planning and where they are hoping to host their feast this year. Well as soon as I saw Street Feast I thought of my bunch of neighbours. We live in a rural community. We’re living a bit of a distance from a bar or any other amenity really. So we usually try and get together a few times a year for a social gathering were the whole family is involved. This is the ideal opportunity to get the old gang and hopefully a few new neighbours to come and join us. I’ll be using my garden as the venue and hopefully all hands on deck with the food and beverages. Decorating will be fun with my own gang and I think entertainment will be down to my 14 yr old’s iPhone! Looking forward to it. Let’s hope the sun decides to stick around. We are planning a more picnic style feast with the neighbourhood invited. We are meeting in our common, well-kept green area and I have asked people to do “pot luck” which is an American idea of whoever attends is asked to bring one dish they prepare themselves. Then everybody that goes gets to sample any dish that is brought and can pick and mix. I intend to set up a small marque with tables and people can put the food on there and then eat on the grass areas picnic style. That’s as much organising as it needs. Whoever turns up turns up. I’ve invited over Facebook. I’m doing it just because sometimes, if somebody doesn’t try, then it never happens. Built by the Iveagh Trust for “the labouring poor” of Dublin, our little arrangement of red-bricked houses off the Crumlin road provides a small oasis in Dublin 12. However, it can be hard to get to know even the closest neighbours given our busy work lives and family commitments. 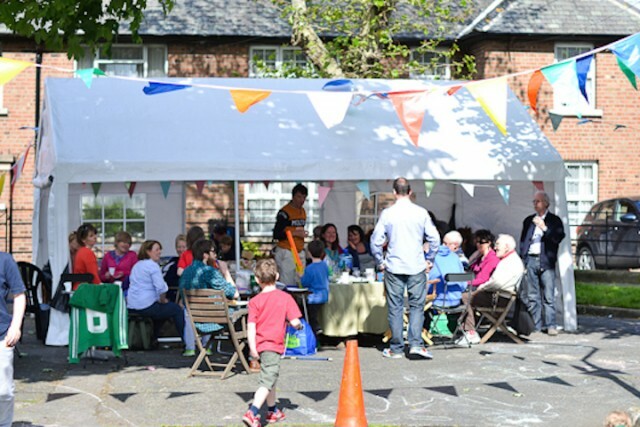 We have had a strong tradition of a yearly BBQ organised by the Residents’ Association, but decided to start a Street Feast tradition when the idea was launched in Ireland. This proved more inclusive – everyone bringing something to the party allows conversation to flow and friendships to form. The Residents’ Association provide a marquee with tables and chairs for the day and everyone pitches in to put up bunting and provide food. Long-standing residents are seated and new neighbours get to introduce themselves. We have found talented cooks, bakers and musicians among our number and are looking forward to discovering more on the 12th of June 2016. As you can see it doesn’t require a lot of effort but only a few neighbours and a strong willing to get together!